Back of card: From a medium blue starry sky, a golden doorframe, with golden gates swinging open. In the center, top & bottom, two golden keys with sunbursts behind each. May be inverted, and contrasts well with the front of the cards. Comments: The box is deceptive. One side shows an ornate doorhandle, the other, an ornate keyhole, both of which trivialize what's inside. Inside, the deck is both original & a significant occult statement. The overall thrust of the deck is to show doors as transitions from one place or state to another, as well as to show the guardians, gatekeepers, doormen, locks & keys associated with them & the prices & penalties they exact (or not) for passage through the various doors. Yet not all the cards relate to this simple theme. Of the cards above, the Two of Swords combines transfer of ownership, abandonment & sudden responsibility, all at a doorway. The Ace of Cups, with its chalice-like baptismal font, shows acceptance into a larger body by means of rite. The Hanged Man is not tranquility under duress, but is in real peril. Houdini, the inventor of this trick, customarily placed a screen between the tank & the audience, that he might work his "magic" unobserved. Without the screen, are we to be privy to the secret, or will we watch a man die? Do you want the answer? Note the man's face on the right. The right side is the side of final outcomes, and he is looking down through his eyeglasses: No hope. The Two of Wands reminds me of the stories I've heard about the Philadelphia Experiment, of WWII. This was where sailors passed through walls, which is what happens when physical matter is booted up (ie, very highly energized) into astral/etheric matter. The Knave of Cups is shown dousing, ie, hunting for underground water. I think this is a very apt use of a water-based suit. 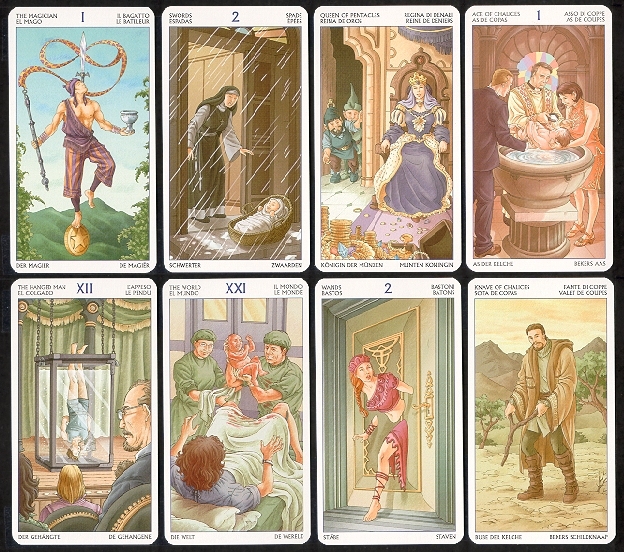 Elsewhere, in cards that are not shown, the Five of Cups shows a woman trapped upstairs. The door below her is in flames. The Queen of Cups is the Blessed Virgin (in non-standard pink) appearing before a penitent. Surprisingly, the Lovers card is based on the Marseilles deck, rather than Waite's revision. The Chariot shows a rock musician, guitar in hand, standing atop his open convertible as it is driven past adoring fans. Justice shows two enormous closed doors, with three small individuals arguing outside it. There are nine steps to the door. Above it is the fragmentary sentence, Iustitia est Constans et (Justice is constant and), which provokes one to wonder. None of the figures holds a key and there is no keyhole, which means that justice will be denied. The Hermit is not shown alone, nor is he shown on a lonely quest. Instead he is shown in a rocky place, fending off an angel bringing him food. The Wheel shows two men, a youth and a woman, sitting around a round table, their hands in seance position. The chairs have no backs. Below the table is a rectangular rug. The Five of Pentacles shows an ailing man outside a doctor's office door. The Eight of Pentacles shows a woman with a bald tattooed head looking through a glass door at man having his back tattooed. The Five of Wands shows a man with a sledgehammer in front of a bricked-up door. (Which reminds me there is no image in this deck of anyone being walled-in alive.) The Seven of Wands shows a man rolling away a stone in front of a cave, which reminds me, there is no Easter Sunday resurrection image in this deck. The Nine of Swords shows a man perched on the center bar in a bird cage. The door is open, but he seems unaware of that. Outside, on a branch, two black birds look at him: Inversion. The Ten of Swords shows an acupuncturist with a patient with 22 needles stuck in his back. The 23rd is in the doctor's hand. The patient looks uncomfortable. Such are some of the images in this remarkable deck. In ecclesiastic architecture of the high Gothic, ie, that of churches & cathedrals, it was common to place statues flanking the main doors. Each of them would customarily hold a book in their hands. If the books were open, then the esoteric secrets hiding inside the building were arranged in such a way that the novice, or uninitiated, might, with study, discover them. If the books were closed, then the secrets were still there, but only the initiated could find them. You will find the books closed at Chartres Cathedral. You will find many interesting things inside the building, the meaning of which remain a mystery. This is another use of the door motif, one missing in this deck.